Man, I hate to-do lists. Checking off finished tasks feels good, but the glow of accomplishment masks an ugly truth: Most to-dos are just reactions to other people’s priorities, not mine. And no matter how many tasks I finish, I’m never done — more to-dos are always waiting to take their place. To-do lists just perpetuate the feeling of “unfinishedness” that dogs modern life. But… to-do lists aren’t all bad. To-do lists let me capture things so I don’t have to hold it all in my brain and stress out. To-do lists let me see everything in one place. They’re a necessary evil. So as much as I dislike to-do lists, I have to have one. There are a billion to-do list apps and methods out there, and I think I’ve tried 900 million of them. My favorite was David Allen’s paper-based Getting Things Done. But I fell off the wagon constantly. When I was organized with GTD, I was damn organized—but every time the system fell apart, I not only lost sight of the big picture, I felt guilty too. So after a lot of ups and downs, I just started doing my own thing, imperfect and simplified. I’ve been using my system for a while now and figured I might share it in case it’s useful to others. Yes, I know, another to-do list system! But you’re the one who clicked on this story, not me, so maybe you’re interested. I’ll explain the name in a sec but basically it’s a simple-as-hell to-do list designed to force me to prioritize. You can fold the paper, draw a line down the middle, or just eyeball it. Precision is unimportant. 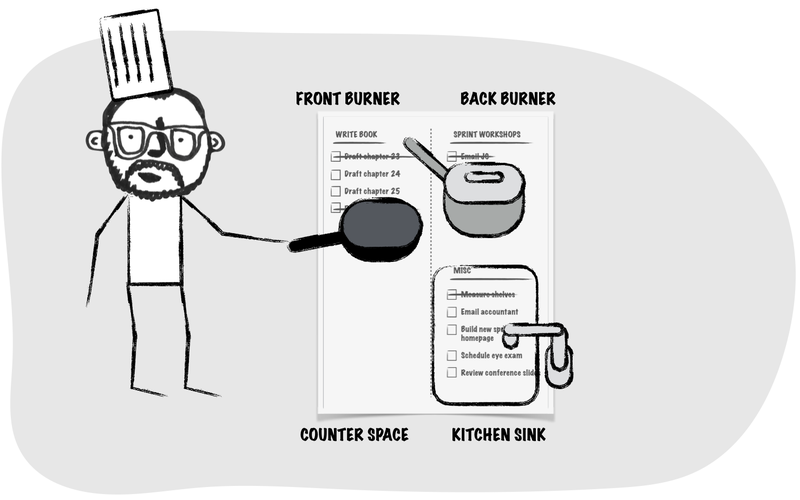 What is important is the metaphor you’ve just created: Left = front burner. Right = back burner. You are allowed to have one and only one project on the front burner. Not two, not three — just one. In the top left-hand corner, write the name of your most important project and underline it. Then list the to-dos for your top project — any task you can do in the next few days to move it forward. Leave the rest of the first column empty. The Burner List is not intended to make an efficient use of the damned paper surface area — it’s intended to make good use of your time and energy! The blank space gives you room to add more tasks for the top project, but, just as important, extra visual space makes it easier to focus on the important stuff. In the top of the right-hand column, write the name of your second most important project and underline it, then write related to-dos underneath. Finally, about halfway down the right-hand column, list any miscellaneous tasks that you need to do but don’t fit with project 1 or project 2. It doesn’t matter if they’re part of project 3 or 4, they just get chucked into the kitchen sink with everything else. Yes, this goes counter to all organizational and productivity advice — but by constraining the space and attention you give to other stuff, you’ll help yourself spend your time well. Imagine there was a chef standing to the left of your page. He’ll naturally focus most of his attention on the front burner. He’s aware of the back burner, and sometimes he stirs a pot or flips a pancake back there, but the front burner is where the action is. The Burner List is intentionally limited. It won’t have room for everything. You’ll have to let go of things that aren’t as important. The Burner List is also disposable. It gets stale fast as you cross off finished to-dos. I “burn” through my list every few days and then recreate it, over and over. This act of recreation is important, because I always discard some unfinished tasks which no longer matter and I reconsider what belongs on the front burner right now. Sometimes it’ll be a work project, sometimes it’ll be a personal project—over time, I’ve realized that it’s okay and natural for the spotlight to shift. What’s important is there can only be one most important project a time. Update: The Burner List was mentioned on the Today show! Although the ensuing discussion was absurd and, worse still, they didn’t even say my name. Still, here you go.